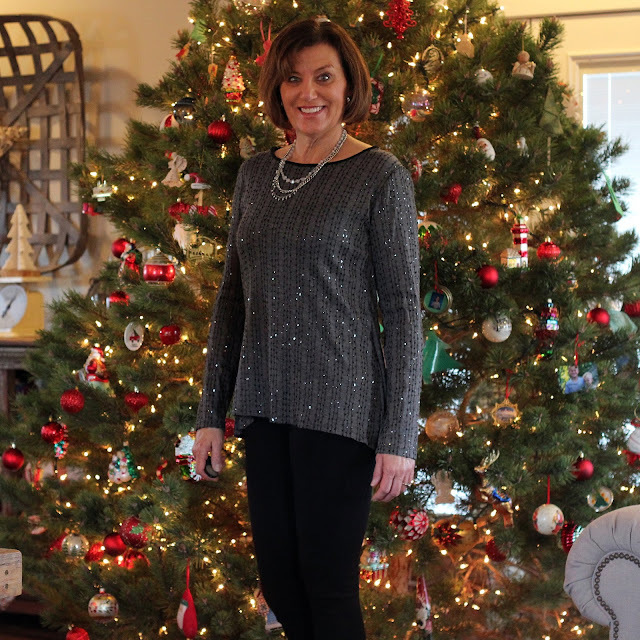 Time to think of holiday party garments and this is my first top for the Christmas season. 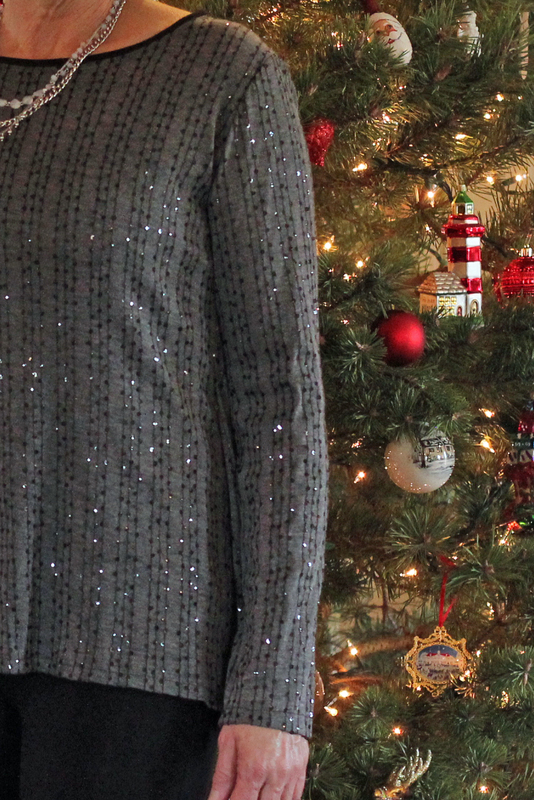 A knit jersey with sequins. I knew I wanted a top from this Gray and Black Sequin Jersey from Mood so I started looking through by patterns. McCall's 7570 is one I bought in the summer and had every intention of making this summer. Shortage of fabric kept this from happening but I was just able to squeeze out this top from my knit fabric. I went with View D, which calls for an overlay but I eliminated the overlay. Also, I wanted the back inset to be a bit different than the rest of the fabric. I went with the wrong side of the sequin fabric. On IG someone asked if the sequins would be irritating to the skin. Yes, they would but the knit fabric is translucent so I camisole is required. The camisole keeps the sequins from irritating my back. Here is a view of the fabric, pretty fun and festive. I did use some black ponte from stash for the neck binding, it just needed a bit of pop. The fabric was a bit tricky to sew, just pretty stretchy and a bit thin. My black ponte JCrew pants were my first thought for this top but really it isn't quite long enough for this style. Good enough for photos but for a party, I will go with a different pair. My usual alterations for one inch for sleeve length and body length were added to the pattern piece. When I make something for Christmas parties, I like to make a garment that doesn't take alot of time. This type of fabric is really something I will only wear once a year. While it is fun and festive, I don't want to put hours into something that sees very little wear time. 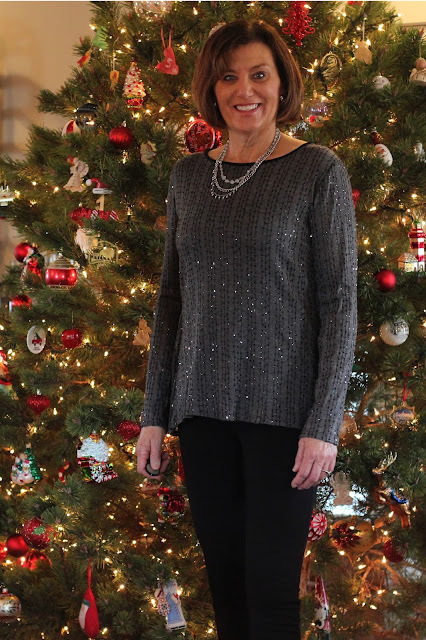 How do you all feel about holiday garments? It's a really lovely top Lori! I love the two fabrics together and the black neck binding is perfect picking up on the darker lines in the sequin fabric. With festive or fancier garments I'm the same as you and don't wear them all that much. I use some for date nights as well as Christmas and prefer not to spend a fortune of fabric for them. I really like the pop that the black ponte neck band give the top. Thanks, that bit of black calms it a bit! The top looks great, and I'm in awe over the size of your tree! I agree with not spending too much time on holiday garments. I stick with traditional colors and cuts so I can wear them again to work functions or volunteer events that don't fall during the holiday season. Your new top looks great!! Your garments are always SO Pretty! Thank you for sharing! Thanks, Dara, I am so pleased on how it turned out. This top is so pretty, and perfect for the festive season! You will bring a touch of sparkle wherever you go. Very cute top Lori. Love the sparkle! thanks, Lisa, the sparkles are fun. Your garments are always SO Pretty! Thank you for sharing!, You do no longer have to make your fingers sweaty and stress so much about moving and changing your place. We are here at your service to turn your imaginations in to reality. We value your values and attempt for giving you the satisfactory out of your USPS change of address form.